One of the great pleasures of blogging about crime fiction is the opportunity of getting in at the start of a new series and recommending the books to others. 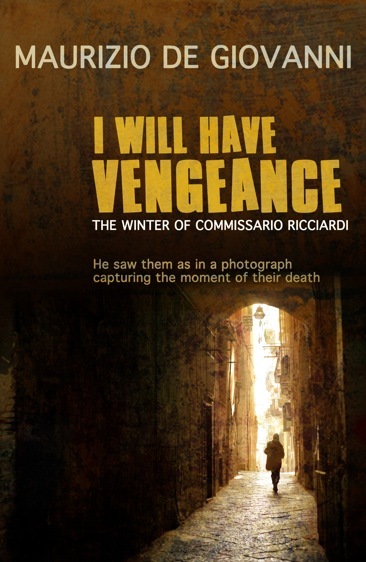 The folks at Hersilia Press were kind enough to contact me, and ask if I wanted to read and review I Will Have Vengeance by Maurizio De Giovanni, the first in a series featuring an enigmatic Naples detective Commissario Ricciardi and set during the Fascist 1930s. The book concerned the violent death of a great tenor, and the combination of an unusual detective, historical setting and Italian opera was impossible to resist. Many many years ago when I lived in London I was able to go regularly to performances at the Royal Opera House in Covent Garden. Even after all these years I can’t forget a wonderful performance of Verdi’s Un ballo in maschera conducted by Claudio Abbado with Placido Domingo and Katia Ricciarelli, or a young Jose Carreras in Donizetti’s L’elisir d’amore. I won’t forget the Donizetti as about two rows in front of us a woman was constantly chatting to her neighbour, and had been asked several times to be quiet, and when at the very beginning of the main tenor aria Una furtiva lacrima, she started to say something to her companion a lady in front of her turned round and hit her in the face! Opera inspires strong emotions. 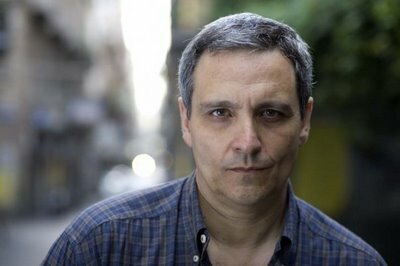 Maurizio De Giovanni, who was born in Naples in 1958, won a writing competition for unpublished authors in 2005 with a short story set in Fascist Italy about Commissario Ricciardi. This was expanded into a novel Il seso del dolore [The sense of pain] subtitled L’inverno del commissario Ricciardi [The Winter of Commissario Ricciardi] in 2007. The title chosen for the English version of the book to be published by Hersilia Press in paperback and ebook formats on the 16 February is ‘I Will Have Vengeance’ is taken from Cavalleria Rusticana, Act One, Scene IX. 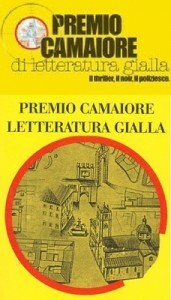 Four more Commissario Ricciardi books have followed, and the fourth I giorno del morti, L’autumno del commissario del Ricciardi was a finalist for the Premio Camaiore, and won the Corpi Freddi in 2010. I Will Have Vengeance is about the murder of Maestro Arnaldo Vezzi in March 1931 during a performance of Pietro Mascagni’s Cavalleria Rusticana , while he waited to play Canio in Leoncavallo’s Pagliacci . Since 1893 both operas have usually been performed together in a double bill. The police detective Ricciardi who investigates the crime is a wealthy aristocrat who is enigmatic and uncommunicative mainly because of the terrible burden he bears, which is that he sees the victims of violent death at the very moment of death. Luigi Alfredo Ricciardi, the man withouta hat, was Commissario of Police with the Mobile Unit of the Regia Questura di Napoli. He was thirty-one years old, the same number of years that marked the century, nine of them under the fascist regime. 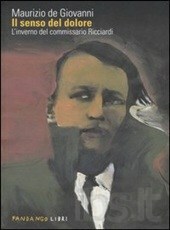 Ricciardi’s physical appearance is described to the readers in great detail and so is his bleak life. He had no friends, he didn’t associate with anyone, he didn’t go out at night, he didn’t have a woman. His family ended with his old tata Rosa, now seventy years old, who served him with absolute devotion and loved him dearly, though she never tried to understand what it was he saw or what he was thinking. Ricciardi is assisted by his subordinate Brigadier Maione, an older family man who despite their difference in social class, worries about Ricciardi like a son, and even gives him personal advice. There have been protagonists with sycophantic fawning superiors in Italian crime fiction, such as Guido Brunetti’s Patta, but this is Fascist Italy and therefore Ricciardi’s Vice-Questore Angelo Garzo is a particularly nasty specimen. He felt he had al the requirements: good looks, excellent people skills………………………………..But in reality he was inept. The climb to his present position had been marked by betrayal, cunning, and servility towards his superiors. And above all by the skillful exploitation of his subordinates capacities. As Ricciardi and Maione interview the staff at the San Carlo Theatre, Vezzi’s secretary, his agent Mario Marelli and his beautiful widow Livia they discover that Maestro Arnaldo Vezzi was a pig of a man, a womaniser and a swaggering brute, who was hated by everyone around him. I never met a single person who liked him, in the ten years that I rendered my services on his behalf. Aside from the powers that be in Rome of course. When it came to licking the feet of those in power, he was bravissimo. And so the scene is set and as the wind blows coldly through the streets of Naples, Ricciardi, while pining for one woman, avoiding the attentions of another and enjoying his favourite lunch of sfogliattella [toppings sealed between two layers of pizza dough and deep-fried until crispy] manages to solve a case that has just a little twist in the tale. This is top quality crime fiction beautifully written by Maurizio De Giovanni, who incidentally does not claim pretensions to literature, and admires both Ed McBain and his compatriot Gianrico Carofiglio. It is unobtrusively translated by the experienced Anne Milano Appel and is a easy read. The story is packed with incidents and larger than life characters. It has a simple but gripping plot that cleverly blends in with the operas. It is also full of information for those who are not opera buffs, and is a commentary on the vast social divides that existed in the 1930s. As an amateur reviewer I am at liberty to say I really enjoyed this novel, especially the intriguing character of Ricciardi and the promise of romance for him in the future with the shy woman Enrica, who he watches through his window. I will definitely watch out for the next book in the series and many thanks to Hersilia Press for my copy. You might also like to listen to the intermezzo from Cavalleria Rusticana. Norman – You’ve sold me. This is one I’d heard of but haven’t yet read. I will definitely have to rectify that. Soon. What a great combination it seems of music, crime fiction and history. I’m so glad you enjoyed it so much. Thanks for this review, Norman. I’ve got this one to read – I’m looking forward to it. Thanks Margot, I was sold on this when I read the synopsis; opera, beautiful women and Fascist Italy. This sounds very interesting, with the combination of music, murder and Italy. Fascism, not so much. Is Commissario Ricciardi a fascist? I’d assume so, since he’s working for the fascist state. If he is, I’ll steer clear of this series. If at heart he isn’t, I’ll read it. He is not, Kathy. Don’t miss it. You’ll love Ricciardi, Maione and the description of Naples in the 30’s made by de Giovanni. I haven’t missed a book (five in Italy, up to now) and I don’t regret a cent spent for them. Just retiring for the night Kathy, but I must say that Commisssario Ricciardi is definitely not a fascist. He regards and treats his party member Vice-Questore Garzo with the contempt he deserves. There must have been caring people trying to do their job while living under this terrible regime. I don’t want to include a spoiler but you can assume Ricciardi believes in real justice. Since Norm and Paola answered my question and assured me that Commissario Ricciardi is not a fascist, I can put this on my TBR list and begin to look for this book here in the States, or at an overseas bookseller, if I can access the book at a reasonable cost. This is good to know. I and friends of mine have begun books set in Spain, for instance, all ready to read and then discovered the main character is a fascist and does horrific things. That is not pleasurable reading. But this sounds compelling and the description of Naples in the 1930’s is intriguing. Book Depository will have this book on sale in 19 days from Jan. 27 at a reasonable price, at least for those of us in the States. They also have Blood Sisters. Do you recommend getting either one first if one is working with a budget, as these are both on my TBR list and the library doesn’t have them? Kathy I think I know the Spanish series you are talking about and I abandoned that after one book. The De Giovanni and Blood Sisters are both very good, and I think you might like the Blood Sisters a fraction more simply because it has a strong female protagonist.